Who is Ken Paulson? For the past five years, his name was glanced over every day by millions of peoples' eyes (possibly including yours). You see, from 2004 until just last month Ken Paulson was the editor of USA Today. And how do I know he likes (or liked) comics? Because I personally bought a handful of beauties from him thirty-one years ago! Back when I was a college freshman, I joined the University of Illinois Comic Book Club. We would congregate in a University meeting room every Thursday evening and have lively discussions about the latest comics and the goings-on in the world of comics. It was great fun, but I wanted to prosletyze beyond the boundaries of that meeting room. I decided to join the staff of The Daily Illini to write articles about comics. The DI was a five-day-a-week (or was it six?) tabloid-sized paper that printed wire stories of world news and syndicated columns as well as student-produced features and local content and commentary. The weekly entertainment-related pull-out section was entitled Revue. I told Ken that I wanted to write an article about comic books (not knowing yet about his interest in them). He asked what did I want to write about comics? I had been collecting original artwork for a couple of years by that time, so I picked that as the topic. Ken approved the idea and off I went. You can see here what the article looked like in print. The New Gods artwork that accompanies the article is by the great Don Newton and Dan Adkins with crisp lettering by the always-excellent Ben Oda, but that is not the panel I would have suggested for inclusion. You can see here the original of the page of artwork, which I supplied to the DI when I handed in my article; I was probably hoping they would instead use the beautiful three-panel sequence that you can see at the top of the page. 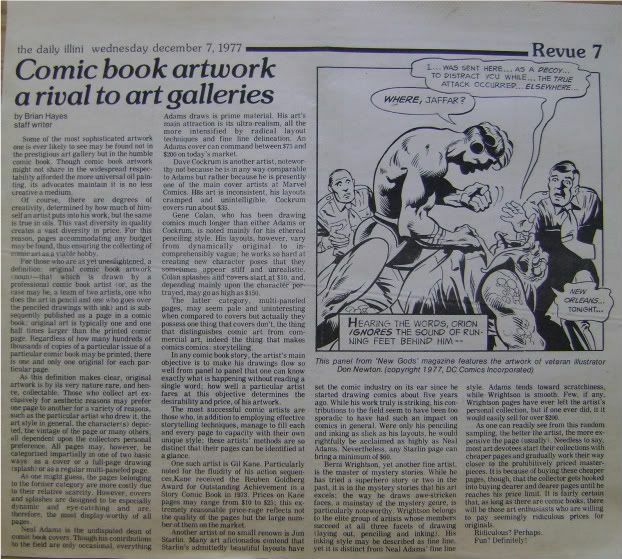 (By the way, I claim without substantiation that this was the first article about collecting original comic book artwork that was ever printed in any newspaper; there have certainly been others since then, such as this one.) To help my little article find a wider readership, I sent a clipping of it to Don and Maggie Thompson who reprinted it in their Beautiful Balloons column in The Buyer's Guide (and they rightfully questioned some of the brash and fannish claims I made in the article, by the way). Ken Paulson was pleased enough with the piece on original art that I was given a green light to propose another. 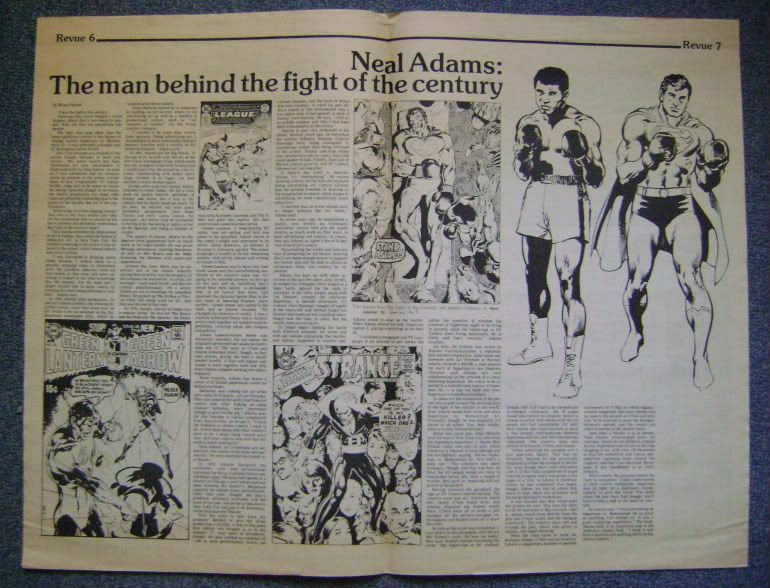 It was around this time that Superman Versus Muhammad Ali was being published by DC Comics, so I pitched doing a phone interview with artist and writer Neal Adams covering his entire career but focusing especially on the Superman/Ali book. Ken flashed the green light again and off I went. It was a bit daunting to be interviewing one of my all-time favorite artists, but Adams was very easy to get along with and the call went well. When I later handed my article to Ken, he grew frantic as he skimmed over it, paging faster and faster. Tell me there are quotes, he said. Well, there (gulp) weren't; I had paraphrased all of Adams' answers, and that wasn't what Ken had been expecting. I made a follow-up call to Continuity Studios in New York City and garnered some quotes that I interleaved into my existing manuscript. The centerspread of that issue of Revue was dedicated to my article and you can see here how it looked. Mike Gold of DC Comics had provided me with photstats that I requested of Adams artwork and the DI's production staff hit one out of the park with their marvelous layout design. Oh, and one more thing! Ken Paulson even let me draw the cover of that issue of Revue, as you can see for yourself here. I must have gotten busy with my studies after that because those were the only two articles I ever wrote for Ken Paulson and The Daily Illini (although I did shift gears and produce quite a few drawings for editorials and feature articles, but that's a blog story for a different day!). Somewhere along in here I did learn of Ken's own interest in comics, and when he told me he was selling some of his collection I couldn't resist seeing what there was to see! 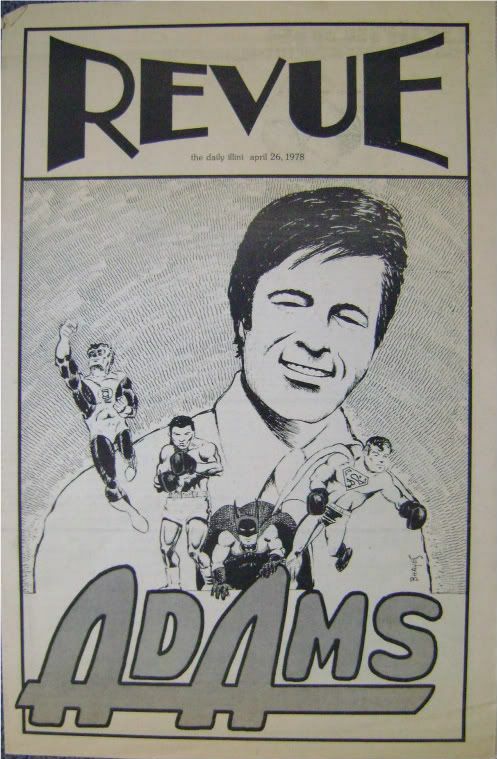 If you can imagine this coincidence, I gravitated toward and purchased his run of Neal Adams X-Men issues, which had been a gaping hole in my collection. Now fast-forward a few decades with me and look at this article from 2004. Yes! The white hair couldn't stop me from recognizing the Ken Paulson that I had known years before, and there he was being named editor of USA Today (not one of the three newspapers I read every day, but I have a respect for every daily newspaper). I couldn't help myself from penning a little congratulatory note to Ken, and I sprinkled it with anecdotal remembrances to tickle his memory bone (such as the fact that he would sometimes invert his name on a byline into the pseudonymous Paul Kennison). Ken dashed off a note in return and he complimented my memory! A couple of years later a nice article about Ken and USA Today appeared in The New York Times (which is one of the papers I read daily). Then at the end of last year it was announced that Ken was moving on. My first thought was to write him another little note, but my second thought was to headline him here in The Hayfamzone Blog. Hooray for second thoughts! And congratulations to Ken Paulson on his successes!